After hibernating in microphone-less caves all summer, Podcast On The Brink finally returns this week with its first episode of the season – and with a twist! 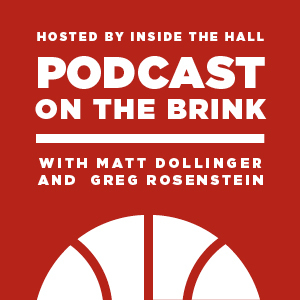 In honor of tonight’s presidential debate, hosts Matt Dollinger and Greg Rosenstein square off in a debate of their own, previewing the Hoosiers’ upcoming season and making bold predictions that will change this country (or something like that). The debate, moderated by the one and only ChronicHoosier, covers IU’s backcourt, preseason rankings, the biggest threats in the Big Ten, what it will take for the Hoosiers to hang a sixth banner in Assembly Hall this season and more. So tune in and hear who comes out on top of our season-opening debate. You’ll be able to listen to POTB throughout the season on Inside The Hall as well as iTunes. Feel free to shoot us a note at [email protected] and let us know what you think. Programming notes: Thanks to Peter Stevenson for the new intro music. And Hoosier Hysteria is Saturday, not Friday, as the podcast accidentally mentions. Awesome Podcast!! You might want to tell them that HH is on the 20th not the 19th. They said HH was on Friday the entire podcast! Great stuff as always guys. Very happy to have POTB back. I’m looking forward to this season and this podcast, especially now that I can subscribe right from my phone. Pleas use some of DC connection to land BeeJay! Great job guys. So glad to have POTB back. Lot of us Hoosiers in DC!!!! It’s about time POTB is back. I was having such withdrawals that from time to time, I found myself going back and listening to old episodes. Welcome back gentlemen! By the way I LOVE the idea of turning the tourney into best of 3 series instead single elimination. I have been saying that for years, it would bring more of a true national champion. I love the underdog stories but in the end i would rather see a final four of all blue blood programs than one that has vcu and teams of that nature. completely disagree. I feel like that takes away a lot of magic of the tournament. Look what expansion of playoff series has done for the NBA, the postseason is a marathon in itself. we need to decide, as a community, who we plan to chant for at Hoosier Hysteria. I feel like doing more than one name dilutes the importance of the gesture. Now, while I love Anya, my vote is for Troy Williams. I don’t care if we already have 2 SF’s committed, he’s on a different level. He seems to be WAY more talented than 31st in the country. Crazy athlete, skilled with the ball, 2 or 3 year guy. Perfect. Seems excited enough for HH that a chant could really make an impression. Very good debate fellas with actual zingers! + As far as the band, love em’, they do a great job, however don’t interrupt a good chant. + Don’t see Hollowell having an impact this year. Could be wrong, but I see Hanner and Yogi having the biggest Freshmen impact. + Mo Creek will have moments this year but next year will be his completed comeback. i have no problem chanting for both players. Lets say everybody just chants for Troy Williams,and he decides to go to UNC. Now Anya is thinking maybe i’m not really wanted,or i’m not as important. But if i had to go with one i would go with Troy Williams. Kid has a nasty game,down right filthy. I am over chanting since Gary Harris…..just pay the kids under the table. Bookends. How about bringing out past IU players. Down the light a bit and let Quinn Buckner lead the past players out of the tunnel while the band is playing ‘Come on without – Come on within – You ain’t seen nothing like the mighty Quinn.’ The first ones in line should be the 76 team with Kent Benson and Scotty May. Kinda like handing off the baton to the next team to go undefeated. I guarantee you that would bring the house down and make this Hoosier Hysteria the most memorable. That would set the bar and let Coach Crean get the past players more involved which has been a goal from the start.